Macy’s is one of those legendary New York City department stores with a history that puts it into a league of its own. But as more customers stuff their wallets with more general rewards cards that can be used anywhere, does it make sense to sign up for a department store credit card? CompareCards.com’s 2018 Store Credit Card Study found that the average store card APR is nearly 25%, and that many cards from the nation’s top retailers come with other fine print that could leave cardholders paying far more in interest than they would with other types of credit cards. Macy’s is known for its designer- and store-brand clothing, jewelry, home goods, accessories and cosmetics sold in its brick-and-mortar stores, and it has a good reputation for service. But are those perks enough for you to consider applying for one of the store’s two credit cards? Shoppers are considered for both the Macy's Credit Card and the Macy's American Express Credit Card when applying; if approved, you can choose which card you want. In this review, we’ll break down the pros and cons of each card so that you can decide if applying for one will be worth your while. 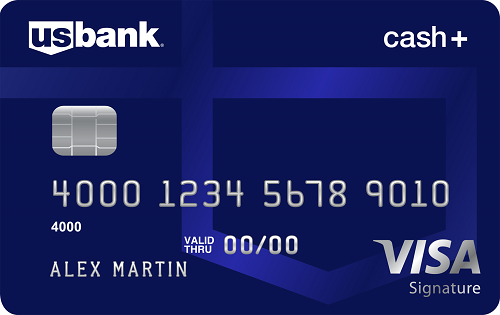 Since the perks on both cards are pretty slim, we’ll also take a look at the U.S. Bank Cash+™ Visa Signature® Card as an alternative for those who don’t want to be tied down to a store-branded credit card. Before we take a look at each of the two cards offered individually, let’s start with Star Rewards, the store’s loyalty program, since it’s tied to the benefits you earn with both cards. Only cardmembers can take part in the top three levels — silver, gold and platinum. Perks: Earn 1,000 points per $1 spent only on Star Money Days; extra savings offers at checkout and invitations to special events; and a birthday surprise. Perks: Bronze benefits, along with a 25% discount on any day you choose with Star passes. Perks: Bronze and Silver benefits, along with free shipping at macys.com. Perks: Bronze, Silver and Gold benefits, along with 5% cashback rewards for card spending at Macy’s, Macy’s Backstage and macys.com. This card is for those who do most of their shopping at Macy’s, either in-store or online. But the perks that come with this card are so paltry that you have to question why you’d even apply for it. The card has a $0 annual fee. The sign-up bonus for new cardmembers allows them to Save 20% today and tomorrow, up to a total of $100. You sometimes receive discounts at the register. There are occasional promotional special event offers where interest is deferred if you pay the balance in full by the end of the promotional period. The more you spend, the better perks you receive under the Star Rewards program. But if you don’t pay off the balance in full in the allotted time frame, you may find yourself on the hook for back interest from the purchase date. The card comes with a steep regular purchase 26.99% variable APR. That adds up quickly if you carry a balance. There are no real perks that come with this card aside from the limited Star Rewards program. You can’t earn Star Rewards with this card except on Star Money Days. And spend them quickly, because each reward is only valid for 30 days after being issued. If you take advantage of special event offers that defer interest on the card but don’t pay it off by the end of the promotional period, the regular purchase 26.99% variable APR kicks back in. Read the fine print with the card’s sign-up bonus, because you only receive the discount when you use the card at Macy’s, Macy’s Backstage and macys.com on the day you sign up or the day after. You can’t use the discount for services, select licensed departments, Apple products, smartwatches/jewelry and select tech accessories, gift cards, restaurants, gourmet food and wine. If you’re not instantly approved for the card, you won’t receive the bonus. If you’re a loyal Macy’s shopper but want to earn rewards for spending outside the department store, this is your card. And thanks to its tie to American Express, you receive travel and protection perks that you’d expect from that brand. You can maintain your affinity for shopping at Macy’s but also earn rewards for spending outside the store with this card. Like the Macy's Credit Card, this card also comes with the same sign-up bonus — Save 20% today and tomorrow, up to a total of $100. You earn 3% back in rewards at restaurants outside of Macy's, 2% back in rewards at gas stations & supermarkets outside of Macy's, and 1% back in rewards everywhere else. It has a $0 annual fee. This card, like the Macy's Credit Card, comes with occasional register discounts and promotional special event offers under the Star Rewards program. For every 1,000 Star Rewards points you earn, you receive a $10 Star Money reward that can be used at Macy’s, Macy’s Backstage or macys.com. You also get some American Express perks, including car rental discounts, cruise ship special fares and amenities, discounts at 18,000 participating hotels, $100 off qualifying air and hotel vacation packages, and access to more than 1,000 premium hotels, complete with a 20% discount on rates, daily breakfast for two, free amenities and the chance to upgrade at check-in. You can also buy tickets to popular events before the general public. Like the Macy's Credit Card, this card also comes with a steep regular purchase 26.99% variable APR. And if you use this card outside the U.S., you’ll pay a 3% foreign transaction fee. You earn the lowest rewards in the popular travel category. Plus, you have to spend a lot of money for a small reward. For example, if you spend $1,000 on travel, $500 at supermarkets or at least $350 on gas, you’ll only get a $10 reward card. You won’t get extra rewards for gas purchases if you fill up at superstores, supermarkets, convenience stores and warehouse clubs. Superstores and warehouses are also excluded from higher rewards in the supermarket category. The rewards you earn on this card can only be used at Macy’s. You can’t use your Star Money rewards for gift cards, furniture and mattress purchases made on macys.com, Beauty Box subscription services or at restaurants inside a Macy’s store. You can also forget using your rewards if you pay in a Macy’s store using an electronic wallet or self-checkout. You have only 30 calendar days after issuance to use your Star Rewards, and you have to buy something on the card every 12 months to keep your points. Maybe you’re not wedded to shopping at Macy’s. Or you may crave more flexibility when it comes to earning and redeeming rewards or seek more generous rewards for department store shopping than what’s offered by the Macy’s credit cards. The Blue Cash Everyday® Card from American Express or the U.S. Bank Cash+™ Visa Signature® Card are solid options. Blue Cash Everyday® Card from American Express cardmembers receive a welcome offer of a $150 statement credit after you spend $1,000 in purchases on your new Card within the first 3 months. Earn 3% cash back at U.S. supermarkets (on up to $6,000 per year in purchases, then 1%). 2% cash back at U.S. gas stations and at select U.S. department stores. 1% cash back on other purchases. While this is lower than what the Macy's Credit Card and the Macy's American Express Credit Card, you do get more flexibility in redeeming rewards, you can get a statement credit for the ones you earn. If you take the Blue Cash Everyday® Card from American Express outside the country, be prepared to pay a foreign transaction fee of 2.7% of each transaction after conversion to US dollars. Earn 5% cash back on your first $2,000 in eligible net purchases each quarter on the combined two categories you choose. 2% cash back on your choice of one everyday category, like gas stations or grocery stores. 1% cash back on all other eligible net purchases. Cardholders can choose two categories each quarter to earn cash back that’s higher than what’s offered by both Macy’s cards and the Blue Cash Everyday® Card from American Express. Among those covered for higher rewards are clothing retailers such as Banana Republic and department stores including Macy’s. While you earn more cash back with this card, it can only be redeemed as a statement credit or deposit to a U.S. Bank savings, checking or money market account or as a U.S. Bank Rewards Card, with a $20 minimum redemption. Registration is required every quarter for bonus categories, although you can sign up for text or email alerts to remind you. And the cash back you earn on your chosen bonus categories is capped every quarter. Rewards None 3% back in rewards at restaurants outside of Macy's, 2% back in rewards at gas stations & supermarkets outside of Macy's, and 1% back in rewards everywhere else 3% cash back at U.S. supermarkets (on up to $6,000 per year in purchases, then 1%). 2% cash back at U.S. gas stations and at select U.S. department stores. 1% cash back on other purchases. 5% cash back on your first $2,000 in eligible net purchases each quarter on the combined two categories you choose. 2% cash back on your choice of one everyday category, like gas stations or grocery stores. 1% cash back on all other eligible net purchases. You need to love Macy’s if you decide to sign up for the Macy's Credit Card since it has meager perks and a high interest rate. The Macy's American Express Credit Card is only slightly better, allowing you to earn 3% back in rewards at restaurants outside of Macy's, 2% back in rewards at gas stations & supermarkets outside of Macy's, and 1% back in rewards everywhere else — but you can only use your rewards at Macy’s. While the Macy's American Express Credit Card does have some American Express perks, the U.S. Bank Cash+™ Visa Signature® Card has more robust rewards for department and retail stores. 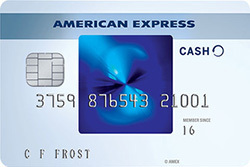 The Blue Cash Everyday® Card from American Express gives cardholders a statement credit for rewards earned, albeit at a lower rate than the Macy’s cards. In the end, both Macy’s cards target loyal brand customers who don’t mind plowing their benefits right back into the store and aren’t focused on other perks. If you want to earn slightly fewer rewards and use them just for statement credits, the Blue Cash Everyday® Card from American Express may be the card for you. But if you want to earn rewards at more than one store and possibly earn higher points per $1 spent at department and clothing stores, then the U.S. Bank Cash+™ Visa Signature® Card is another option.